The hearing is announced just hours after she and several colleagues said the Supreme Court nominee and his accuser, Christine Blasey Ford, should testify before the Senate Judiciary Committee. Sen. Susan Collins of Maine was among the small group of Republican senators on Monday who called for the Senate Judiciary Committee to hold a hearing on a sexual assault accusation against Supreme Court nominee Brett Kavanaugh. Just hours later, the White House announced that a hearing will be held next Monday. “Professor (Christine Blasey) Ford and Judge Kavanaugh should both testify under oath before the Judiciary Committee,” Collins said in a tweet Monday afternoon before the White House announcement. Ford’s accusation that Kavanaugh sexually assaulted her at a high school party in the early 1980s threatens his chances of being confirmed to the nation’s highest court. Collins already had been among the senators seen as possible swing votes on his confirmation. She has faced intense pressure from both sides while maintaining she has not yet decided how to vote. Republicans hold a slim 51-49 majority in the Senate, so it would only take two Republican “no” votes to sink Kavanaugh’s nomination, if all Democrats and independents vote against him. Collins did not respond to requests for comment Monday. However, in a hallway interview in Congress carried live Monday afternoon by CNN, Collins told reporters that “to be fair to both sides” there needs to be a hearing. “Obviously, if Judge Kavanaugh lied about what happened, that would be disqualifying,” Collins said as she was surrounded by reporters and microphones. Collins said Kavanaugh “emphatically” denied the accusation when she asked him about it during a phone call Friday. The call came after a general outline of the allegations had surfaced, but before Ford was named and quoted in a Washington Post story over the weekend, and before she agreed to testify. Ford, a psychology professor at Palo Alto University in California, had originally wanted to remain anonymous but will testify before the Senate Judiciary Committee on Monday, as will Kavanaugh. Ford, in a Washington Post story on Sunday, came forward and provided details of the alleged assault by Kavanaugh at a high school party in the early 1980s. President Trump’s Supreme Court nominee, Brett Kavanaugh testifies before the Senate Judiciary Committee on Capitol Hill in Washington this month during his confirmation hearing to replace retired Justice Anthony Kennedy. Ford has supported her account with a therapist’s notes from 2012 and her husband’s statement to the Post that she had told him about the assault when they were in couples therapy. She also has passed a lie-detector test. 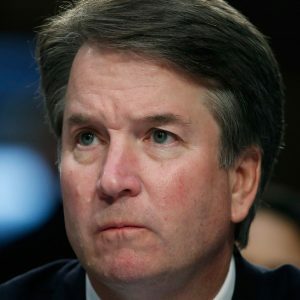 “I have never done anything like what the accuser describes – to her or anyone,” Kavanaugh said in a prepared statement. Democrats have been solidly opposed to the nomination and quickly called for a full hearing and a delay in the nomination process. So has Maine Sen. Angus King, an independent who caucuses with the Democrats. But Collins was one of a few Republican senators to publicly call for or suggest a delay. The others included Jeff Flake of Arizona, Bob Corker of Tennessee and Lisa Murkowski of Alaska. Even before the sexual assault allegation surfaced, Kavanaugh was a controversial nominee who could tip the balance of the court to the right. He would replace Anthony Kennedy, who has been a centrist swing vote on a court with four more liberal justices and four more conservative members. Collins was under pressure by progressives who fear, among other things, that Kavanaugh would weaken or overturn Roe v. Wade, the landmark decision that made abortion legal in all states. Marie Follayttar Smith, of Mainers for Accountable Leadership, a liberal activist group that has lobbied Collins to vote against Kavanaugh’s confirmation, said that in light of the sexual assault allegation against the nominee, Collins needs to do more than just join the call for a hearing. “She responded in her traditional and deliberative way,” Follayttar Smith said. “She should be showing more support for Christine Ford.” Follayttar Smith said the accusation reaffirms what the group sees as a consistent pattern by Kavanaugh, who they say has ruled against women’s interests. “We expect Senator Collins to protect Maine women,” Follayttar Smith said. Collins has previously been outspoken about sexual assault accusations against politicians. In November 2017, she called for Republican Senate candidate Roy Moore of Alabama to withdraw from the election after several accusations of sexual misconduct involving teenagers emerged, mostly dating to the late 1970s. “I’m sure it will work out very well,” Trump said. Sen. Orrin Hatch, R-Utah, told reporters in Washington that even if the sexual assault accusations are true, it shouldn’t disqualify Kavanaugh from being on the Supreme Court. “If that was true, I think it would be hard for senators to not consider who the judge is today. That’s the issue. Is this judge a really good man? And he is. And by any measure he is,” Hatch said. While the new allegation could add to the pressure on Collins to vote against the nomination, it also increases the possibility that the nomination does not get to the full Senate and she doesn’t have to vote at all. 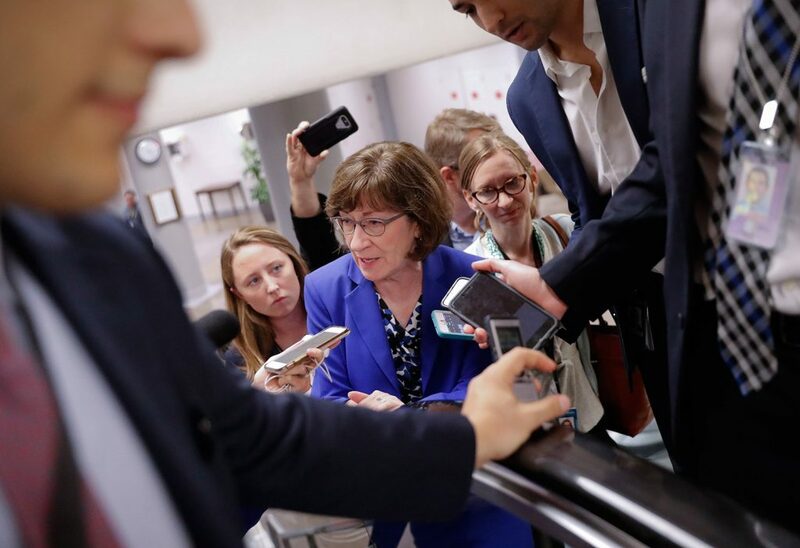 Brian Duff, a political science professor at the University of New England, said that for Collins, the best political outcome would be for the nomination to be withdrawn. “She would much prefer to not have to take a vote on this,” Duff said. Duff said if Collins votes “no,” she would anger conservatives and more likely face a Republican primary challenger if she runs for re-election in 2020. If she votes “yes,” she would hurt her chances in the general election, because independents and centrist Democrats, who make up a large percentage of her constituency, would be displeased. Also, if the vote were scuttled, that would end a crowdfunding campaign that has raised nearly $1.4 million that could go to a Democratic challenger to Collins in 2020. The money is specifically tied to Collins’ vote on Kavanaugh. If she votes “yes,” more than 40,000 potential donors’ credit cards would be charged. But if there were no vote, the money could not be used to fund a 2020 Democratic nominee. Collins spent about $6 million on her 2014 re-election campaign. Collins has said she was offended by the fundraising campaign and has compared it to bribery.